Ross Paterson is a renowned Australian painter who has a love of the landscape and a unique ability to interpret the distinctive character, light and atmosphere of his subject. Painting around his home in northern Victoria, he travels into the Australian bush to paint views of the dry, hot countryside. He also tackles a street scene in the old mining town of Rushworth as well as a rickety wooden bridge over a rapidly drying out creek. 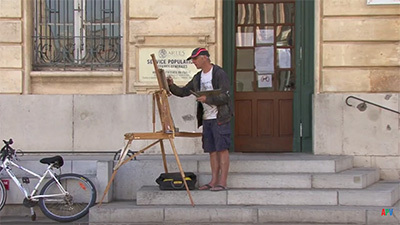 Finally, he paints a further street scene from a sketch, working in his studio. Northern Victoria is the setting for a new film from APV featuring the award-winning Australian artist, Ross Paterson. 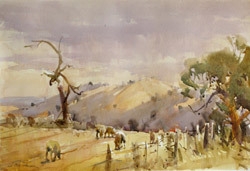 The film, Summer Light in Watercolour, includes five demonstrations starting with two fairly similar views of the Strathbogie Ranges. Before venturing outside, Ross sets out the theoretical basis for his painting. He emphasises the importance of drawing and the value of making a variety of studies. He also advises aiming for unity, simplification and clarity. This academic start feels a little abstract; it becomes far easier to appreciate his approach once he goes out to paint on location. The first view demands warm tones to capture the dry vegetation towards the end of a hot summer. It offers a pleasing composition with two sweeping hills dipping into a valley, receding into cooler tones through the aerial perspective in the distance. Paterson talks through his method and choices of colour, reserving the highlights, and altering the features where necessary to create a stronger design. He shows how the colours become much warmer, and more contrasting nearer the front of the picture plane. The second painting is the same view seen from about 30 degrees to the right of his initial position. He uses a similar approach, but this time shows how to make the composition more interesting by breaking the harsher lines formed by the hills and gullies, by using the outlines of animals and fences. For the third demonstration Paterson moves from the country to Rushworth, an old gold rush town that offers interesting architectural shapes. He shows how, as the temperature rises, he needs to spray water over his paper to maintain moisture. 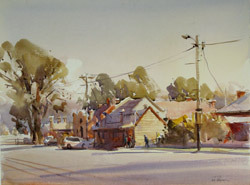 To give the painting depth, and as a foil to the complexity of the buildings, he adds tone and directional shadows on the road in the foreground. Back in the countryside, he then tackles a rickety bridge over a rapidly drying creek, which offers great contrasts of light and shade. 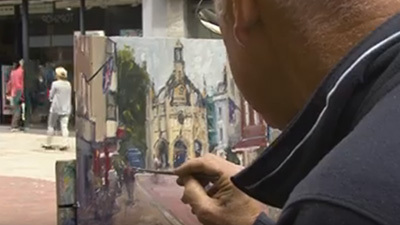 His technique is to paint everything as though it is in full sunlight, and then add washes and glazes to create a sense of depth and shadow. 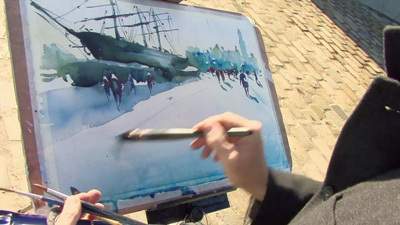 His final painting is done back in his studio, working from a watercolour sketch of Murchison, originally painted on location. The shapes within the composition offer a strong sense of design, and Paterson uses similar devices to those in the Rushworth painting to create depth and unity. 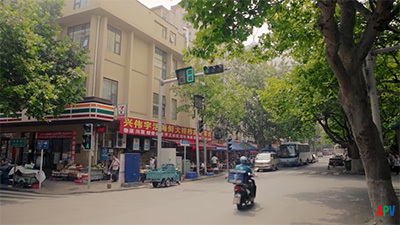 The film encourages viewers to try Paterson�s loose and impressionistic style that so successfully captures the atmosphere of the day and place. 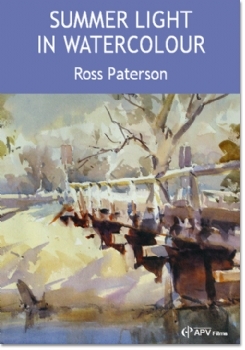 Australian painter Ross Paterson has a magic touch, as he shows in Summer Light in Watercolour. 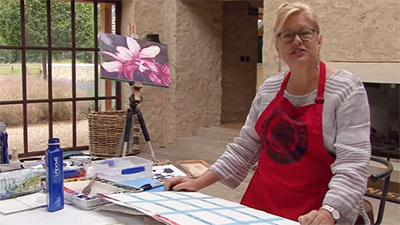 In his studio in northern Victoria, Ross begins with some information on key points about concept, design and simplicity in watercolour painting. He then travels out into the Australian bush to paint two far-reaching landscape views, a street scene in the former gold-mining town of Rushworth, and an old wooden bridge with its exciting patterns of light and shade. Ross�s technique is fascinating to watch. 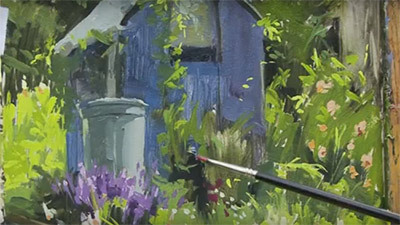 Usually he starts with a big mop brush and quick, broad, weak washes of colour to establish an underpainting to suit the mood and impact he ultimately wants to achieve. He then builds on this, often working wet-into-wet, but always considering tone and colour relationships across the whole painting. His film is a masterclass in capturing atmosphere and the essence of the subject. Excellent artist, And the DVD is out of this world. Another winner from APV films. Ross Paterson is such a great guy, In the way he dosn't look down on people, and helps all he can to answer any questions you may have. This DVD is one of the best I have ever seen. Good luck to you Ross. You are a star mate. Excellent instuctional DVD.Ross presents a very modest, natural manner on film and uses some facsinating technqiues.The way Ross does his shadows brings real warmth to paintings. Highly recommended. 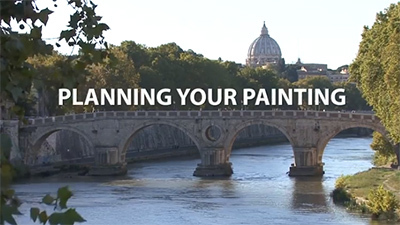 As a watercolourist myself, I've got several APV films on the subject. This one is one of my favourites. There are no gimmicks with Ross Paterson, just lots of talent. He can certainly paint light and you can almost feel the heat. My favourite demo is the old wooden bridge, depicted on the cover, but they're all good. There's also a good number of his paintings in the stills gallery.